This book, along with the people and projects presented in it, has touched my heart. I believe this ReInhabiting the Village can change the course of mankind by helping people realize the importance of the varied subjects covered. -Robert D. Reed, Ph.D. Created and curated by Jamaica Stevens and Executive Produced by Keyframe-Entertainment, the “ReInhabiting the Village: CoCreating our Future” ebook is now available for download with iBooks on Mac or iOS devices, and with iTunes. "ReInhabiting the Village" is a book and online community hub project showcasing the work of twelve Visionary Artists and over sixty contributing authors sharing their experience, best sustainable living practices, strategies and resources to empower communities through practical wisdom and inspiring perspectives. Authors include Charles Eisenstein, Ian MacKenzie, David Sugalski (aka The Polish Ambassador) and ALIA, to name a few. The book features twelve themes, each with an associated color and sigil. Chapter topics are: Heart of Community, Health and Healing, Art and Culture, Learning and Education, Regional Resilience, Inhabiting the Urban Village, Community Land Projects, Holistic Event Production, Living Economy, Media & Storytelling, Appropriate Technology, and Whole Systems Design. Each chapter contains introductions from author Jamaica Stevens, a breadth of articles from contributors, author biographies, visionary art, community photography, informational graphics, inspirational quotes and project features. The book also features a list of References, Credits, Contributors and a Glossary. 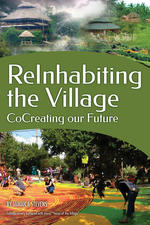 The “ReInhabiting the Village” project also secured a paperback book publishing deal with Robert Dr. Reed Publishers. Dedicated to “making this a better world one book at a time,” founder of Robert D. Reed Publishers (Bob) has produced and distributed close to 2000 titles in his 45 years as a publisher, including House Calls: How we can all save the world one visit at a time by Patch Adams, M.D. — the compassionate and humorous doctor portrayed by Robin Williams in Universal Picture's hit film, "Patch Adams." In addition to publishing books, Bob has been a co-author of more than 50 books and resource guides on a wide range of subjects, including: environmental issues, current affairs, health, business excellence, responsible leadership, helping women to get elected to political offices, creating high-quality education, effective parenting, psychology, ending domestic violence and child abuse, homelessness, human and animal rights, healing racism, and peaceful activism. “Since I have been publishing books over the past forty plus years, I have encountered many important subjects. This book, along with the people and projects presented in it, has touched my heart. I believe this ReInhabiting the Village can change the course of mankind by helping people realize the importance of the varied subjects covered. It truly is meeting my goal of ‘Making this a Better World One Book at a Time.’ I AM HONORED,” says Robert D. Reed, Ph.D, founder of Robert D. Reed Publishers. “When I learned that we at Robert D. Reed Publishers were going to be publishing ReInventing the Village: CoCreating the Future, I was really excited. It is the most beautiful book ever… a real piece of art on every page! The work it must have taken Jamaica Stevens to gather 68 authors and 14 artists to collectively have a similar vision to make this a better world and contribute to this book… it is mind-blowing! This book is an absolute masterpiece,” states Cleone L. Reed, M.S.E. Production Supervisor of Robert D. Reed Publishers. “ReInhabiting the Village” paperback books are currently in production and will be available in July. For quantity discounts or a review copy, contact the publisher at address: Robert D. Reed Publishers, PO Box 1992, Bandon, OR 97411, or email: 4bobreed(at)msn.com. Jamaica Stevens will also be hosting two workshops at the 2016 Symbiosis Gathering. “ReInhabiting the Village: The Workshop” will be held on Sunday September 25th from 1- 2:15pm, and the “Leadership in the Regenerative Living Movement” panel will also be held on Sunday from 4-5pm. Set from September 22 - 25th at California’s Woodward Reservoir, Symbiosis Gathering's mission is to “facilitate peak experiences through a synaesthesia of art, music, transformational learning, and sustainable living integrated into an unparalleled extravaganza of fun beneath the starry skies.” The event will also feature permaculture workshop by Ryan Rising; co-founder of Permaculture Action Network and organizer of the Pushing Through the Pavement: a Permaculture Action Tour with The Polish Ambassador. To learn more, go to: http://symbiosisgathering.com/workshops/speakshops-luminaries/re-inhabiting-the-village-co-creating-our-future/. The “ReInhabiting the Village” project was made possible through a successful Kickstarter crowdfunding campaign, which garnered over 400 supporters and raised over $30,000 in December 2014. Project sponsors include Lucidity Festival, North Atlantic Books, Beloved Festival, Kinnection Campout and Village in a Box, to name a few. The book also received pre-book launch praise coverage on Uplift Connect and was recently featured on Fest300. In addition to its existing list of partners, the project has also secured new partnerships including Fellowship of Intentional Communities, Bioneers, Northern California Permaculture Convergence, Activated Villages, Emergence Earth and Arcadia Mountain Sanctuary, to name a few. Visit the ReInhabiting the Village website at: http://reinhabitingthevillage.com/ and to learn more about how the project influences festival culture, go to the Fest300 "ReInhabiting the Village" article. "Re-Inhabiting the Village: Co-Creating our Future" is a multi-media book and online community hub project co-created by an alliance of visionary partners contributing knowledge to foster thriving projects, organizations, and communities. Rooted in holistic living principles, this project offers an inspiring roadmap and blueprint for building a legacy for our future through the shared development of social technology tools, innovative templates, models, resources and information that are useful to communities everywhere. The project entails a printed book, interactive eBook, participatory workbook, and web-based resource directory. Keyframe-Entertainment produces, finances, and distributes cutting-edge projects by forming strategic partnerships that generate growth for its clients and partners. By INSPIRING, INFORMING and ENTERTAINING through film, electronic music, visionary art, community building, and Transformational Festival culture, Keyframe aspires to create global positive change. Keyframe is the Executive Producer of “ReInhabiting the Village,” “The Bloom Series” Episode 3, and “Electronic Awakening,” and the Associate Producer of The Polish Ambassador’s Permaculture Action Tour film. Keyframe also offers marketing support and strategic networking to DJs, producers, companies, filmmakers, nonprofits, and festivals. Always dedicated to “making this a better world one book at a time,” the fun-loving and generous founder of Robert D. Reed Publishers (Bob) has produced and distributed close to 2000 titles in his 45+ years as a publisher, including House Calls: How we can all save the world one visit at a time by Patch Adams, M.D. — the compassionate and humorous doctor portrayed by Robin Williams in Universal Picture's hit film, "Patch Adams." In addition to publishing books, Bob has been a co-author of more than 50 books and resource guides on a wide range of subjects, including: environmental issues, current affairs, health, business excellence, responsible leadership, helping women to get elected to political offices, creating high-quality education, effective parenting, psychology, ending domestic violence and child abuse, homelessness, human and animal rights, healing racism, and peaceful activism. Profits from one of his cookbooks fed millions of children worldwide through the C.A.R.E. Organization in New York City. Many of his authors have been featured on television and radio programs, and in newspaper and magazine articles throughout the world.